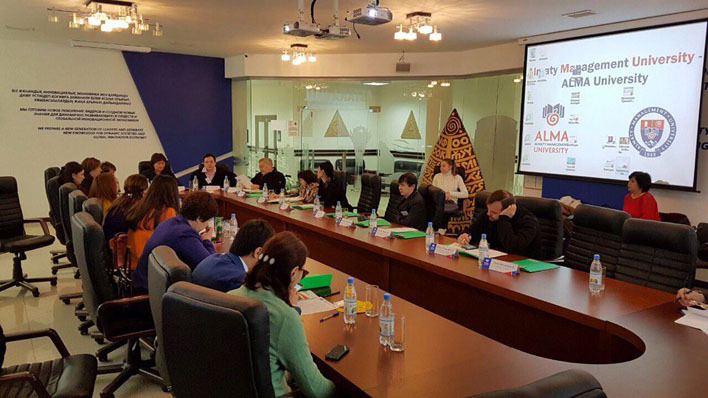 On 23 November a round table was held in Alma Management University. The theme of the round table: Realization of the right to work of persons with disabilities in Kazakhstan. The event was organized by Soros Foundation-Kazakhstan, attended by the UNESCO Office in Almaty, NGO, National Chamber of Entrepreneurs, the Union of Organizations of the Disabled, governmental and public organizations. According to channel 24 KZ at 1 November 2015 had registered 625000 persons with disabilities, 404000 from them represents the able-bodied population and only 8738 from them found employment. UNESCO Office in Almaty presented the presentation: UNESCO Programme YouthMobile - opportunities of employment. YouthMobile Initiative gives opportunity for youth to solve problems of sustainable development and youth unemployment and problems of the setting up small-scale businesses with help of the mobile applications. True stories of the successful employment of disabled persons were presented by the nongovernmental organizations: employment experience of disabled persons in Coca Cola Almaty Bottlers, Bank Home Creit - the bank of the equal opportunities for all, online sign language interpretation - an effective tool for interpersonal Communication. • To conduct information activities to overcome the negative stereotypes of the community against women and girls with disabilities and their employment.